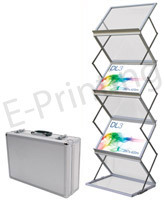 Curved 3x3 Pop Up Display with Counter! 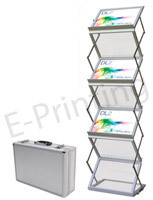 Our range of portable literature presenters and brochure holders provides you with an easy way to display your brochures and literature in an organised and attractive manner at product launches and exhibitions. Although portable and erected in seconds they are sturdy and simple to use complete with a stylish alloy carry case with padded interior.